The call for Europe’s newest robotics competition opened yesterday when a consortium of leading robotics and research institutions from across the EU announced the launch of the European Robotics Challenge (EuRoC). The competition will consist of a series of three industry-relevant challenges created to help keep Europe’s manufacturing industry globally competitive and at the leading edge of innovation. € 7M in grants, funded through the European Commission, will be awarded throughout the duration of the four-year program. The three challenges will take place in successive stages that will increase in complexity from simulation to real work environments. In the first stage, up to 45 applicants will compete in a simulation challenge, allowing new players to compete with established robotics teams. The most promising applicants will be paired with industrial end-users at a match-making event, and 15 of these “challenger teams” (5 per challenge) will be admitted to the second stage of the competition. The second stage will focus on realistic lab testing, and qualifying teams will each receive up to € 375K to further develop their solutions. Only six teams (2 per challenge) will move to the final stage, where they will each receive an additional € 210K to compete at a public event where they will demonstrate their solutions in practical field tests. A single EuRoC winner will be chosen from this group. 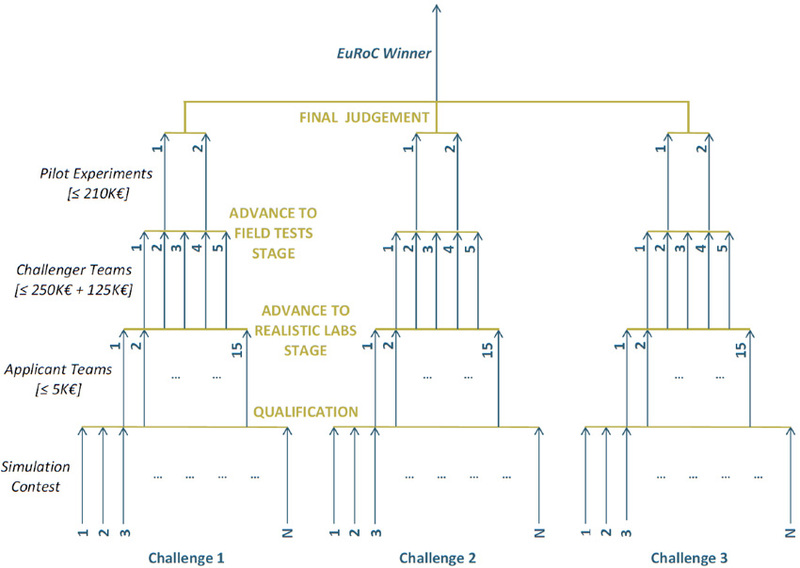 More information about the challenges and how to apply can be found on the EuRoC website and at: info (at) robotics-challenges.eu.